Only a month after the death of the late Ghanaian president, John Atta Mills, the prime minister of Ethiopia Meles Zenawi has been confirmed dead. He died at the age of 57 after weeks of illness. According to a government spokesman, Zenawi died in a hospital abroad, although he did not mention the name of the country. Mr Meles took power as the leader of rebels that ousted communist leader Mengistu Haile Mariam in 1991. He was austere and hardworking, with a discipline forged from years spent in the guerrilla movement – and almost never smiled, says Elizabeth Blunt, the BBC’s former correspondent in Addis Ababa. Kenya’s Prime Minister Raila Odinga told the BBC he feared for the stability of Ethiopia following Mr Meles’ death. He said the situation in the country was fragile and ethnic violence continued to be a threat. 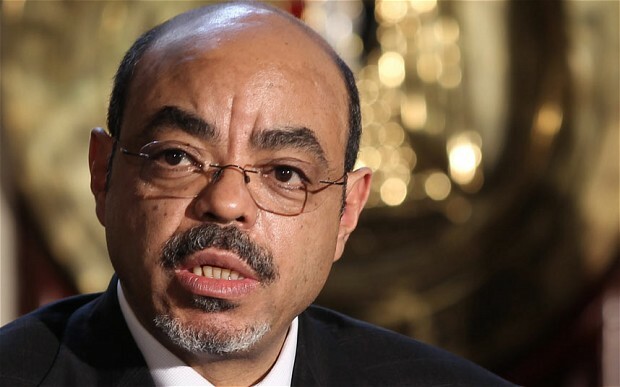 Ethiopia’s Council of Ministers announced “with great sadness the untimely death of Prime Minister Meles Zenawi” in a statement, state TV reported. “The premier [had] been receiving medical treatment abroad for the past two months and his health was improving, but due to a sudden infection which occurred [on Sunday], he went back to hospital for emergency treatment, and even if a lot of medical attention was given by his doctors, he died yesterday at around 23:40,” the statement said. Mr Meles had not been seen in public for some eight weeks prior to his death, and was reported to have been admitted to hospital in July. But three weeks ago, government spokesman Bereket Simon told the BBC that he was in “a good condition and recuperating”, and dismissed reports he was critically ill.
At the time he declined to give any details about Mr Meles’ whereabouts or what he was suffering from. Some reports suggested Mr Meles was in hospital in Belgium, suffering from a stomach complaint. Other reports said he was in Germany. Under Mr Meles, Ethiopia became a staunch US ally, receiving hundreds of millions of dollars in aid over the years, and hosting the US military drones that patrol East Africa.